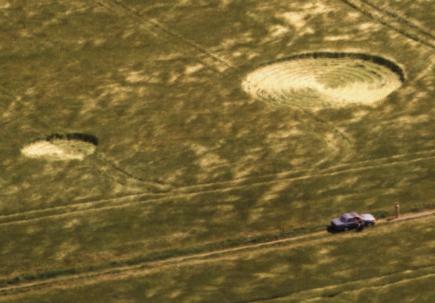 What happened to crop circle researchers at Cheesefoot Head in 89? standing crop and about a metre away from the circle edge on the eastward side. person to be present. I told her there was a seventh person with us but it was in spiritual form. from the north side of the circle around to the west and eventually stopping on the south side. circular transition from north to south. we grabbed hands and it was then that both of us began to be pulled back and downwards. and, still crouching, we quickly worked our way back to the group at the north side. Colin and the others to join me. After a few minutes we all decided to leave the circle. can also transmit and receive information over vast distances. mind, to which we have a recall. their findings wildly different while in the same location. always a list of hard facts. expectancy, the impossible was possible. Evidence'. Pat gave up his research in 1991 and is retired living in Hampshire, England. THIS PHOTOGRAPH MUST NOT BE REPRODUCED. Photograph Copyright Hampshire Police. MUST NOT BE REPRODUCED.